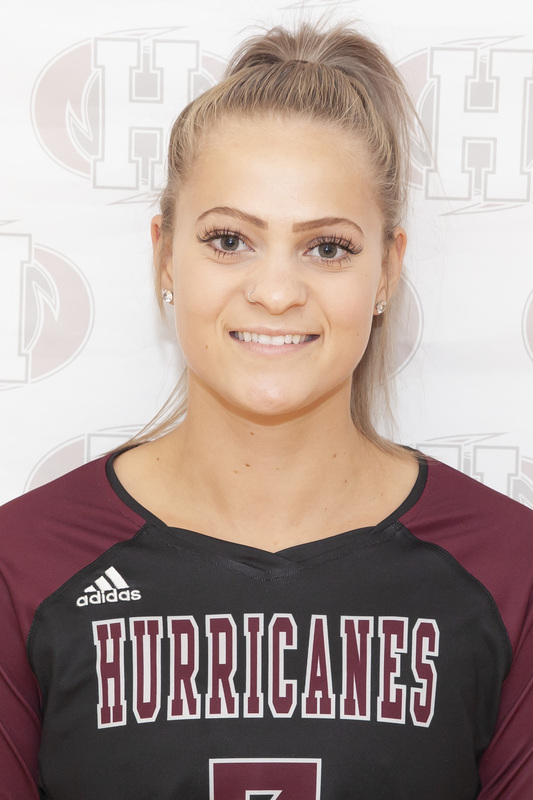 The Holland Hurricanes men’s and women’s volleyball teams each went 1-1 on the weekend with the women knocking off the UKC Blue Devils on Saturday before falling to the MSVU Mystics on Sunday; both games were played in Halifax, Nova Scotia. On the men’s side the ‘Canes split a pair of matches at home against the STU Tommies. In the women’s match on Saturday versus the Blue Devils, the ‘Canes won in straight-sets; scores were 25-15, 25-15 and 26-24. Jasmine Smith led the attack for the Hurricanes with ten kills with Abby Hyndman adding seven. Laura Ready had 21 assists while Katie Wood and Hyndman had 14 and 11 digs respectively in the win. Abby Hourigan led the Blue Devils in the loss with nine kills and six digs. On Sunday, in a battle versus the top-ranked MSVU Mystics, the ‘Canes fell in the fifth set. Set scores were 21-25, 20-25, 25-16, 25-23 and 15-9 for the Mystics. Hyndman and Smith both had 12 kills to lead the attack for the Hurricanes with Taylor Allen chipping in with seven. Laura Ready had 35 assists while both Allen and Wood had 15 digs for the ‘Canes with Smith adding 10 digs in the loss. Madison Urquhart was the offensive leader for the Mystics with 17 kills and 13 digs in the win. The ‘Canes are now 12-6 on the season and in a tie for third with the Mount Allison Mounties; they trail the UNBSJ Seawolves who sit in second at 13-7. The UKC Blue Devils are in sixth with an 8-11 record while the Mystics are in first at 19-0. The Hurricanes have just three regular season matches remaining before the ACAA Championships hosted at Holland College. The ‘Canes have their eyes on a second-place finish, which gives them a bye to the semi-finals. They trail the Seawolves by just two points, with two games in-hand, for second place. In Saturday’s men’s game versus the STU Tommies, the ‘Canes lost by set scores of 10-25, 25-19, 25-17, 26-28 and 15-9. Brett Butler led the attack for the Hurricanes with 16 kills while Jeff MacDonald added nine and both Riley O’Keefe and John Ronalds recorded eight. Nicholas Menzies dished out a match-high 40 assists for the ‘Canes with Marcus Lapointe recording a match-high 25 digs in the loss. Christian Christie led the attack for the Tommies with 15 kills and eight digs in the win. On Sunday the Hurricanes rebounded with a four-set win; set scores were 21-25, 27-25, 25-21 and 30-28. Simon Archibald and Butler each had 14 kills with Ronalds adding 13. Nicholas Menzies had a match-high 50 assists while Marcus Lapointe led a balanced defensive effort with 21 digs. Archibald added 18 digs with MacDonald and Butler adding 12 and ten respectively. Garrett Dickson was the top offensive performer for the Tommies, recording 14 kills and seven digs in the loss. With the weekend split, the ‘Canes are now 7-7 on the season and in third place in the ACAA standings while the Tommies lead the conference with an 11-3 record. The Hurricanes will complete their ACAA regular season on Saturday when they host the Université de Sainte-Anne Dragons (1-13, fourth) at 7pm at the Holland College Centre for Community Engagement. The Hurricanes are scheduled to take on the UNBSJ Seawolves (9-5, second) at the 2019 ACAA Volleyball Championships in semi-final action on February 23 at 7pm at the Holland College Centre for Community Engagement. For more information on ACAA volleyball, visit www.acaa.ca. To connect with the volleyball Hurricanes, please visit www.twitter.com/caneswvball and www.twitter.com/canesmvball.